This is the perfect bench for the entryway or foyer offering a comfortable spot to sit and take your shoes off. Many also choose to place this bench at the dining table in place of chairs. The beautiful bench back brings to mind the American heartland with fields of wheat tied in a bundle. Customize this solid wood bench by designing it with our many options. Choose the bench size, wood, finish, leg style and choice of arms. After your custom bench options are selected we get our Amish woodworker to start creating your dream bench. You will be impressed with the quality construction of our Amish furniture. 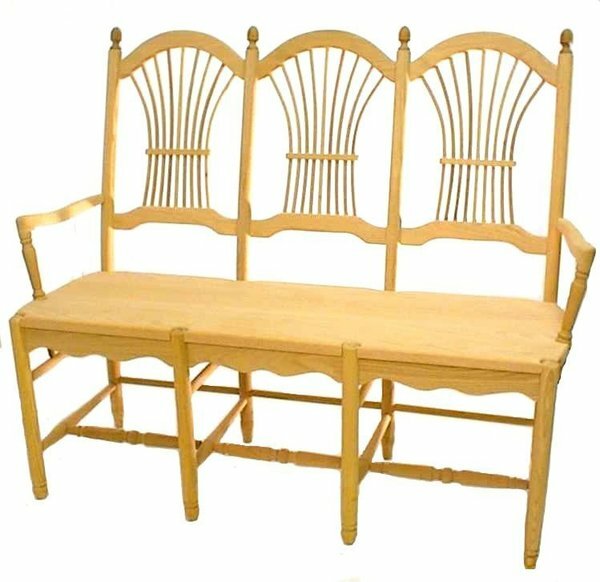 Bring some Early American furniture into your home with this Sheaf Back Bench from DutchCrafters Amish Furniture Store. with the bench. Please let him know I appreciate his good work! I have had so many compliments and as you can see it really fits into my home PERFECTLY!! !